Let’s start counting. How many Calgary Public Library programs have you attended since January 2013? A few. That’s a good start. A lot. That’s a good way of spending your time: learning and meeting people of diverse cultural background. 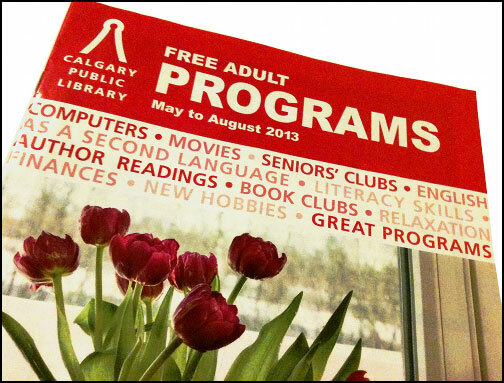 Just recently, the Calgary Public Library Adult Program Guide for May-August 2013 was made available for the public online and in all 18 branches of the Calgary Public Library. I’m done reading and choosing programs that pique my interest and I’d like to mention some as well. Imagine seven hours of various activities enabling you to spend less and to travel safely. For newcomers or not, with summer on its way, everybody can make better use of Traveling tips. So spend your time wisely. Get your free copy. And don’t forget to take someone with you. It’s better to share the experience of learning new things with others. With every participation you can realize the importance of being part of adult program. Are you going to outdo yourself with the number of programs you have registered in the earlier issue?